A ceremonial groundbreaking Jan. 25 marked the beginning of construction of a new factory in Huntsville, Alabama, that will build Blue Origin's BE-4 and BE-3U engines. WASHINGTON — As Blue Origin breaks ground on a new factory for producing rocket engines, the company says development of its BE-4 engine will be completed later this year. 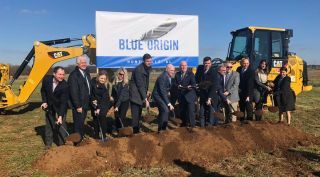 Blue Origin held a groundbreaking ceremony in Huntsville, Alabama, Jan. 25 to formally mark the start of construction of a factory that will be used for building BE-4 engines. The company announced plans to build the factory there in June 2017, contingent on the selection of the engine by United Launch Alliance for its Vulcan rocket. ULA picked the BE-4 in September 2018. "This engine production facility demonstrates commitment to the state of Alabama," said Bob Smith, chief executive of Blue Origin, in remarks at the groundbreaking event webcast by a local television station. He and others there said that discussions about locating the factory in Huntsville took place over several years before the company made its selection in 2017. "It also demonstrates our confidence that the highly skilled workforce and business climate in Huntsville will play a critical role in advancing our vision of millions of people living and working in space." The facility will create more than 300 jobs, Smith said, with a total company investment of more than $200 million, figures similar to those that Blue Origin offered when it made it selection of Huntsville in 2017. While Blue Origin builds the factory, it's continuing to test the BE-4 engine, which uses liquid oxygen and liquefied natural gas propellants and is capable of producing up to 550,000 pounds-force of thrust. The company is building initial versions of the engine at its headquarters in Kent, Washington, and testing them in West Texas, where it also performs test flights of its New Shepard suborbital vehicle. "It will be a true marvel of engineering when we complete its development this year," Smith said of the engine. "We are currently rocking our test stands out in West Texas." He didn't provide additional details about the status of BE-4 development and testing, but during a webcast of the latest New Shepard test flight Jan. 23, Ariane Cornell, head of astronaut strategy and sales at Blue Origin, said the engine has been tested to 70 percent of its rated thrust and for durations of more than 200 seconds. A new version of the engine will soon be installed at the test site, she said, "and we're going to be going up to 100 percent power." Blue Origin plans to use the Huntsville factory to also produce the BE-3U engine, a version of the liquid-hydrogen/liquid-oxygen BE-3 engine used on New Shepard modified for use on the New Glenn second stage. Two BE-3U engines will power that second stage. Smith announced at the groundbreaking that Blue Origin is working on agreement with NASA's Marshall Space Flight Center to take over Building 4670 at the center. That site, a test stand previously used for testing engines for the Saturn 5 and shuttle, will be used for acceptance testing for both the BE-3U and BE-4 engines. "Through this agreement, we'll provide for the refurbishment, restoration and modernization of this piece of American history," Smith said. Blue Origin and NASA Marshall signed a Space Act Agreement in July 2018 to cover "suitability analysis and preliminary facility preparations" for potential use of the test stand for engine testing by the company. Attending the groundbreaking event with Smith were members of Congress as well as state and local officials, all of whom praised Blue Origin for deciding to locate its factory in Huntsville, known as the "Rocket City" given the long history of rocket development work at Marshall and Redstone Arsenal. "Blue Origin and United Launch Alliance represent what we're all about in Alabama," said Alabama Gov. Kay Ivey. Also in attendance was Tory Bruno, president and chief executive of ULA, which builds its rockets, including the future Vulcan vehicle, in nearby Decatur, Alabama. "The people of Alabama have provided us with wonderful leadership in this state, which is as passionate about rockets as we are," he said. "I would not do this anywhere else."